The volume is a logical disk that the system presents to the attached hosts. 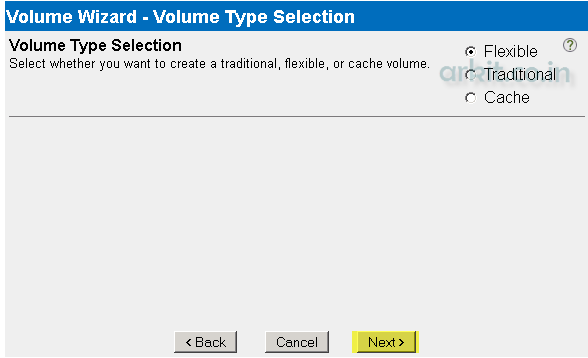 The Data ONTAP 7.0 features two types of volumes are Traditional and Flexible Volumes. 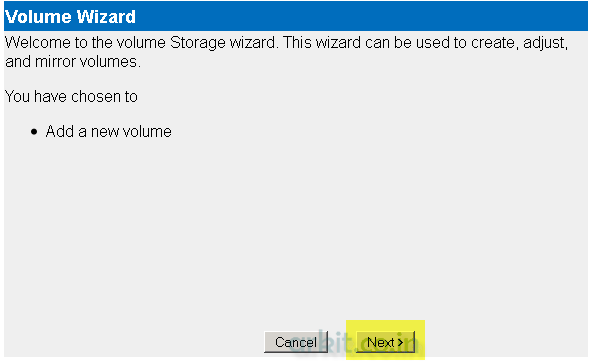 In this article we are going to learn about How to create a Volume in Netapp GUI Mode 10 easy clicks required. 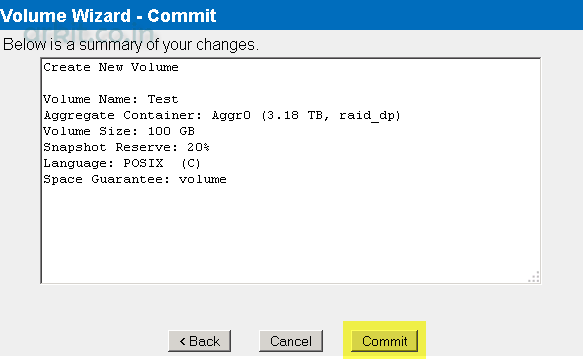 The Traditional volumes will behave identically to the volumes in Data ONTAP releases prior to version 7.0. this will combine with the physical layer of storage (the disk & RAID properties) with the logical layer of the filesystem (the containers and the volumes that are used to store files and directories). 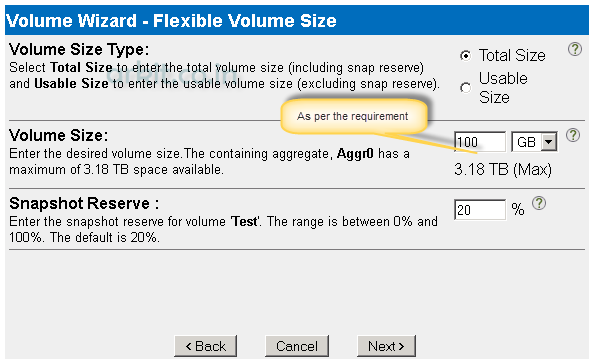 The Flexible volumes (also called FlexVol volumes) allow us to manage the logical layer of the filesystem independently of the physical layer of Netapp storage. These multiple flexible volumes can exist with a single separate, physically defined aggregate structure of disks and RAID groups. These flexible volumes contained by the same aggregate share with the physical storage resources, RAID (Redundant Array of Inexpensive disks) configuration, and plex structure of that aggregate. It will perform the administrative and maintenance tasks as backup and restore on an individual flexible volumes rather than on a single as well as large file system. It will set services like snapshot schedules differently for an individual flexible volumes. It will minimize the interruptions in data availability by taking the individual flexible volumes offline to perform the administrative tasks on them and the other existing flexible volumes can remain in online. It will save time by backing up and restoring individual flexible volumes instead of all the file systems an aggregate contains. Note: For backward compatibility, volumes created prior to Data ONTAP 7.0 are displayed as traditional volumes in FilerView. We can create up to 500 flexible volumes and traditional volumes on a single storage system. In addition, the following limits will apply. Traditional volumes: We can have up to the 100 traditional volumes and aggregates combined on a single storage system. Flexible volumes: The only one limit imposed on flexible volumes is the overall systems limit of 500 for all volumes. For all clusters, these limits may apply to each node individually, so that the overall limits for the pair are doubled. Now we will see how create a volume in GUI practically. The Cache volumes (also known as FlexCache) allows us to keep the copies of primarily read-only files and on multiple filers to reduce the overhead caused by distance limitations or by the bandwidth. A flexible volume or traditional volume is needed as primary copy on an remote host. The origin filer is located far away : The usage in this situation will reduce the overhead caused by trying to access the data that is far away and may take a long time to get there. The origin filer experiences too much traffic: The usage in this situation is used to reduce the bottleneck of the filer, since the throughput is limited. FlexCache license is required on both the origin and FlexCache filers to create a Cache volume. Origin filer requires option.flexcache.enable set to on. 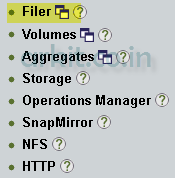 The origin server needs to set option.flexcache.access to specify all caching filers. You can create up to 500 flexible volumes and traditional volumes on a single storage system. In addition, the following limits apply. Traditional volumes: we can have up to 100 traditional volumes and aggregates combined on a single storage system. Flexible volumes: The only limit imposed on flexible volumes is the overall system limit of 500 for all volumes. Cache volumes: You can have up to 100 cache volumes. 6. Here we have to provide the Volume Name, Language, snaplock and UTF-8. But provide only the Volume name remaining keep it as default. Uses only letters, digits, and underscores. Uses no more than 249 characters. Volume names must be in ASCII characters. It specifies the language that we want to use on this volume. The default language is the same as that set for the root volume. Note: It is strongly recommends that all volumes will have the same language as the root volume, and it will set the volume language at the of volume creation only. By changing the language of an existing volume it can cause some files to become inaccessible. 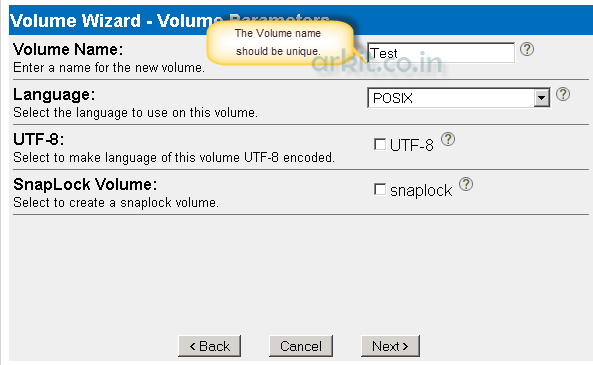 The term “SnapLock volume” is used to describes the volumes that can contain Write-Once-Read-Many (WORM) data, in fact SnapLock is an attribute of the volume’s containing aggregate. Any type of volume like flexible or traditional, contained by a SnapLock aggregate is by definition a SnapLock Volume. if we want to create a FlexVol that uses SnapLock, you must already have a SnapLock aggregate of the appropriate type (SnapLock Compliance or SnapLock Enterprise) with sufficient space to contain the new FlexVol. 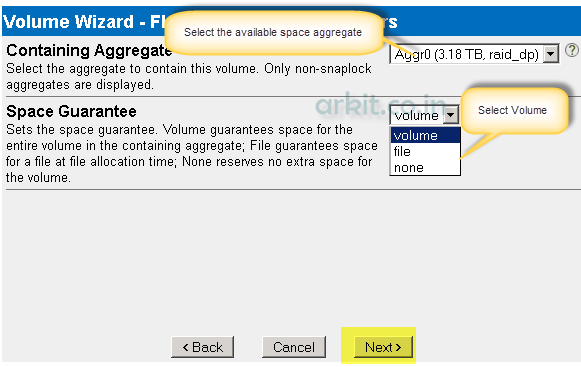 If such a SnapLock aggregate is not available, you will not be able to create the new SnapLock volume. If you want to create a traditional volume that uses SnapLock, the traditional volume is so tightly bound to its aggregate that you can create the traditional volume and its aggregate in one operation. You do not need to have a SnapLock aggregate available. If you have any technical questions about this tutorial OR any other tutorials on this site, if you require any topic please send us a feedback by commenting.